While recovering from a devastating betrayal, Solina becomes increasingly drawn to Thorin as he helps her hunt down Skoll, the mythical wolf who vowed to kill her. If she can find and destroy the beast, she’ll bring a swift and brutal end to her enemies’ schemes. But nothing ever goes as planned in Solina’s strange new world. During her search for Skoll, Solina uncovers a plot to unleash a battalion of legendary soldiers and launch an apocalyptic war. Before she and her allies can locate the fabled army, several ghosts from her past return to haunt her. Solina must fight for life and the fate of the world, or her hopes for love and a peaceful future will go up in flames. As the fight to prevent Helen from starting Ragnarok draws near, the volatile relationship between Solina and Thorin develops. Solina continues her work in controlling her fiery powers; however, a betrayer posing as a friend leaves her group one step behind, and Solina decides to try to gain the advantage by learning more about her ability to see into the future. Her journey leads her to another plane of existence where her brother, Mani, waits. He encourages her to continue fighting the battle, yet a part of her yearns to be with him. Will her drive to save the world from Ragnarok and be by Thorin's side outweigh her desire to be with her brother? 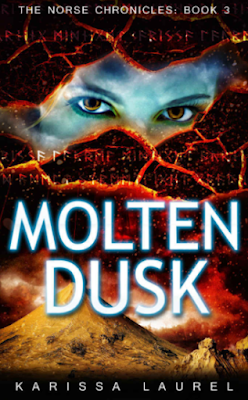 Molten Dusk is an amazing story that had me on the edge of my seat from the first page. I want more! The character development is off the hook! Solina's powers have evolved during the series, and so has her personality. She's seen some pretty terrible things, watched as those closest to her have died, and fallen in love. If that doesn't make a demi-goddess evolve from a squishy and scared mortal into a force to be reckoned with, I doubt anything will. As Solina's character evolves, we get to learn a bit more about Thorin's past and see another side of him. While he still remains a scary Aesir with a big hammer, we see his loyalty, his concern for Solina, and his desire to keep the past from repeating itself. The settings in the book are spectacular! The words leaped off the page and straight into the movie reel in my mind, providing me with panoramic views of the places in the book. Laurel did such a great job with the descriptions and it really set the tone for the different chapters of the book. The premise is totally enticing and enthralling. Will Hel ultimately triumph over the Aesir, the Valkyries, the Allfather, and Solina to start Ragnarok? It's fantastic because it's an age-old story filled with battling gods, love, betrayal, and action; however, all of this is going on in a realistic, contemporary setting. What more could a gal like me who enjoys mythology and contemporary paranormal books ask for? If you're like me and enjoy a bit of mythology combined with clean romance and narrated from a new adult point of view, you'll fall in love with "The Norse Chronicles" and Molten Dusk! Karissa Laurel, author. Courtesy of Goodreads. Karissa Laurel has tried her hand at many things -- cooking/catering, law, art -- but writing makes her the happiest. When she's feeling brave, she's on the slopes or riding off-road motorcycles with her guys. When she's less adventuresome, she's on the couch with her nose buried in a book. She lives in North Carolina with her kid, husband, occasional in-law, and a hairy husky named Bonnie.